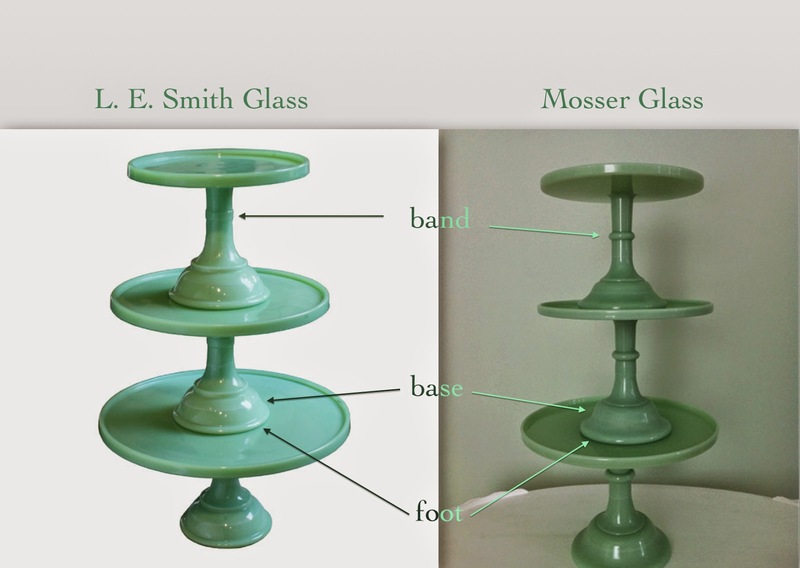 Dear David: Are Mosser glass cake stands the same as the ones that were sold through Martha by Mail when the catalog was around? They look the same to me, but I’m not so sure. Thanks for your help. I’m glad you brought this up because there seems to be some confusion out there about the Mosser Glass cake stands and those made by L.E. Smith for Martha by Mail. The differences between both styles of cake stands are very subtle, yet the hallmarked areas along the stem of the pedestal tell you what’s what when you take a closer look at them. Once you pick up on those differences, it is very simple to determine who made what cake stand. 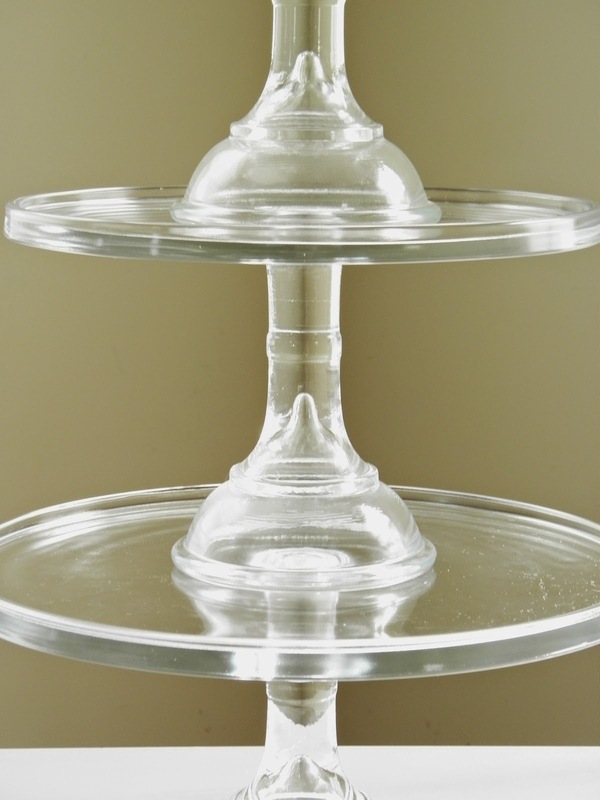 You will never make the mistake again of confusing both of these styles of cake stands from two of America’s premier glassworks. The jadeite glass, milk glass, pink glass, delphite glass and clear glass, which seem to follow traditional colors from the 1950s, makes it rather problematic for some people to see beyond the spectrum of these shades. It’s the silhouette of the cake stands one needs to pay close attention to. I think we can agree that the cake plates themselves, meaning the flat rounds where cakes sit, are pretty much the same on both the L.E. Smith and the Mosser. It's the stem of the pedestal where the contrasts begin to tell a different story. Both cake stands have a band halfway down the stem. The Smith stand has a wider band that barely protrudes from the stem. The Mosser stand has a very thin ring which protrudes noticeably. The base of the L.E. Smith stand is cupped, rather like a plunger. The Mosser base is 'bell-shaped' and curved. Also, the Mosser base is more substantial. The foot of the L.E. Smith stand has a flat lip, whereas the Mosser foot is rounded and smooth. Can you tell the difference now? Remember, the band along the stem, the base and the foot of the cake stands will tell you which is which. I hope this easy tutorial helps you decipher the differences between these two makers of American cake stands. The L.E. Smith cake stands that I own are used throughout the year for celebrations and holidays, and they are cherished indeed. Although I don't own any Mosser glass (yet! ), I greatly admire the silhouette of those beauties. Both Mosser & L.E. 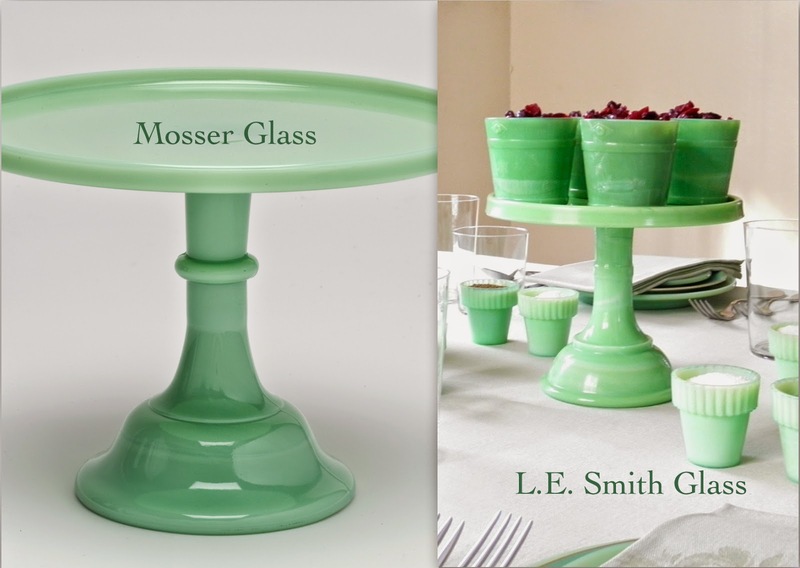 Smith glass cake stands are gorgeous and deserve a place in our homes. 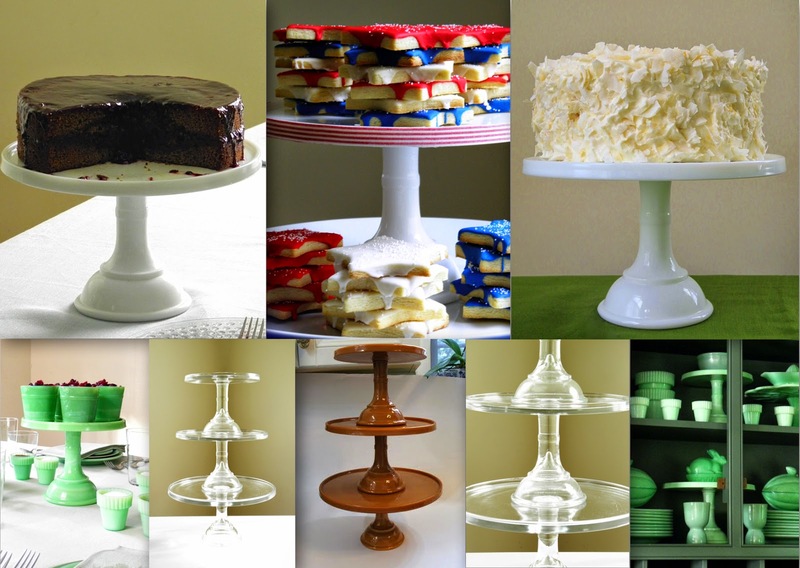 Whether you use them for display or for desserts, cake stands make a charming addition to one's kitchen & dining room. Great post! I have the set from Mosser that I enjoy, and once upon a time had the clear set from Martha, I sold it after I collected a set of 3 antique stands. I am sharing this post with friends confused about the subtleties. Thank You so much!! Oh wonderful, Bernie! Those Mosser stands are really nice aren't they?